With Thanksgiving just around the corner, you might be ordering your turkey and getting your shopping list together. While you’re surely thinking of the main event, the food, you might not have put much thought into the backdrop, your Thanksgiving table. Check out some of our favorite ways to create a cute, festive Thanksgiving tablescape. If you’re looking for a thoughtful addition to your Thanksgiving table, you might consider adding each guest’s name to their place setting. You could stick to a traditional name card or you could step a little outside the box. Write each guest’s name onto a place card, then tie them to a miniature pumpkin or gourd. Place each one onto the guests’ respective table spots. This can add a rustic feel to your table. Whether or not you’re getting out the ornate china dishware, you can always add some visual interest to each place setting by using colorful napkins. You might stick to classic fall colors, like shades of brown, yellow, orange and red, or you could try something a little different, like a forest green, navy blue or rich purple shade. Fold your napkin in a traditional or fancy shape, then set it on top of each plate. You might prefer to try an adventurous napkin-folding decoration. If you want to be ambitious, try folding your napkins into turkey decorations. Check out Martha Stewart’s tutorial for a walkthrough of this fun turkeytastic activity. Plaid is always a popular choice at this time of year, but this year has showcased plaid more than it has since the release of the 1995 movie “Clueless.” Experiment by using this favorite fall pattern on your table, for a classic Thanksgiving look. Not all Thanksgiving table settings should look the same. One huge factor that determines the way you should decorate your Thanksgiving table is the table shape. A rectangular table requires different decorations than a circle or square table. Make sure you keep this component into account when creating your display. Thanksgiving is a day of love and abundance. Don’t hesitate to add some cheer to your Thanksgiving centerpiece. 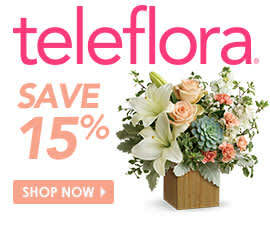 Teleflora offers plenty of gorgeous fall-toned bouquets that will liven up the table. Teleflora’s Wild Autumn Bouquet incorporates shades of orange that are reminiscent of the pumpkin pie that you are piling onto your plate. Where as, Teleflora’s Changing Leaves Bouquet is made up of bright sunflowers, carnations and chrysanthemums that embody the joy of summer and the coziness of fall. You can shop from our selection of Thanksgiving Flowers to find the best color palette and mood to match the rest of your setting. If you’d rather decorate your table with flowers and candles instead of dense plates of food, you might prefer to leave the serving dishes in the kitchen. Not only does this reduce clutter and make more room for the important stuff, it makes the serving process more efficient. When people get up to get seconds (and thirds), they won’t disrupt everyone else’s meal by asking them to pass each dish. However you choose to decorate your Thanksgiving table, we hope you have a wonderful holiday with your family and loved ones!